Quadriceps exercise chair (children): hardwood constructed chair with cushioned seat and back is provided with an adjustable laminated incline ramp, six laminated wooden blocks and a storage box. Child pushes the blocks from the ramp to the box for ankle, knee & hip exercises. We are manufacturing and supplying multi exercise chair. 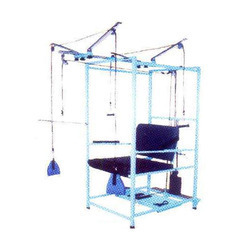 Glass Agencies are manufacturer of Multi Exercise Chair. » Specially designed chair that can be used in small therapy departments where space is limited. » Tubular steel chair of 100 cm long x 67 cm wide is fitted with overhead bar that extends out 80cm from the frame. - Construction : Square tube of 30mm construction with weight pan assembly & storage tray. 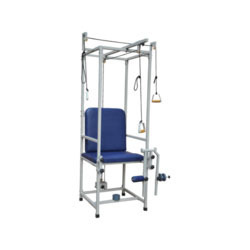 - Size : Floor area, 100cm long x 67cm wide, the overhead bar extends 80cm Beyond front portion of the frame.